1. 請連上 GS3700 透過 Web Gui. 2. 進入 IP Source Guard 頁面. Advanced Application > IP Source Guard > Source Guard Setup. 3. 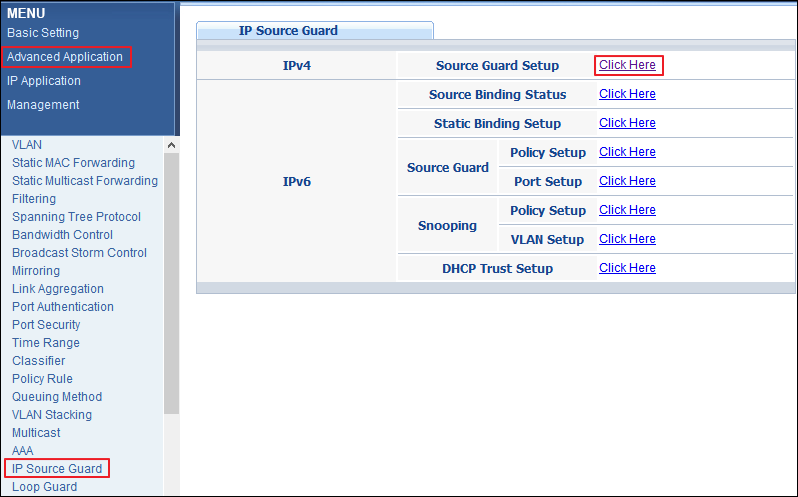 進入 DHCP Snooping 設定的頁面. (c). 請打勾 "Active" 再點擊 "Apply" 才能完成套用功能，然後請點擊 "Port". (a). 把要設定的VLAN 填上去 (例如: VLAN100) 再點擊 "Apply". (b). 再把 VLAN 100 的欄位，請 Enabled 改成 "Yes"，再點擊 "Apply". 7. 請重複步驟 "2", 再點擊 "ARP Inspection". 9. 進入 ARP inspection Configure畫面之後，請把 Active 打勾 然後點擊 "Apply". (b) 然後再VLAN 100欄位請 Enabled改成 "Yes"，再點擊 "Apply". Switch 就會去記錄 IP 對應的 MAC 並存放在白名單裡，若有駭客嘗試攻擊網路會被Switch阻擋下來. 端口安全 是指 port security ? 這功能是限一port 可以幾台機器上的. 你的需求應是用IPSG + ARP inspection 來完成. 1. 進入 GS3700 的 Web GUI. 2. 進入 IP Source Guard Static Binding 的頁面. 然後接上所有end device，再點擊 "ARP Freeze" 的功能. ARP Freeze 會自動建立 static binding 到 IP source guard table裡. 使用 ARP-freeze 之前請確保 ARP-learning mode 是設定成 ARP-Request. ARP Freeze 完之後，請設定回 "ARP-Reply" (因為在正常使用方式下依舊建議使用 "ARP-Reply"). 3. 接下來再設定 “ARP Inspection” 的功能.